Mom Blogging was good to me. I had a good run, great even. I and many of my peers had the obscene luxury of making a living simply by living our lives. I’m not sure if Mom Blogging today could ever exist as it did in 2006 or even in 2009. Publicists certainly got involved with bloggers quickly but marketers were a little slower to come to the party. To be fair, bloggers were slow to behave like professionals, especially me. I meet women all the time who want to be Mom Bloggers. The reality is that Facebook made everyone a Mom Blogger. The reason that Mom Bloggers were able to earn a living a dozen or more years ago was because there was a high bar of entry. You either had to know how to build a website or afford to have one built for you. That meant that blogs were interesting. They were written by smart or rich people, and who doesn’t want to peek into a wealthy lady’s life (I’m looking at you Pioneer Woman). Of course the smart people are engaging because – well, because they’re smarter than you and I.
I’m not smarter than anyone and I certainly didn’t have more money. I just sort of stumbled into Mom Blogging at the right moment and did it a little differently than the others. Sometimes being different is helpful. Mostly though it got me shunned. Surely today will be no different. Recently in a Facebook group marketers were comparing notes about how difficult it is to work with Influencers and the conversation quickly evolved into storytelling about which Instagram famous dogs have the most difficult owners and how hard it can be to deal with their agents. Yes, really their agents. Instagram has changed the influencer landscape dramatically. Who doesn’t remember the (not particularly complimentary) New York Times article about Instagram Kids? The reality is that Instagram dogs will die and mom bloggers (I include Instagrammers and YouTubers in this) will have their children grow up and be less adorable. Some of these kids will have their adolescence shared with audiences of various sizes and some kids will have parents who phase out their parenting sites because the stories are no longer shareable. The moment to blog daily about motherhood and earn a living has come and gone. The space is crowded, ad networks are routinely late with payments and there’s a limit to how many sponsored posts people can read. Before you ask yourself if you want to become a mommy blogger ask yourself what your child will gain from it, what your child will sacrifice for it and how you plan to pay your child for the use of their image. France is in the process of changing laws so that children can sue their parents for the photos they post online. Yes, it’s absurd but it’s the first bit of legislation that I know of which addresses the fact that entire families are making a living based upon the images of their children. I’m waiting for the Jackie Coogan laws from film and television to be applied to the children of mom bloggers. 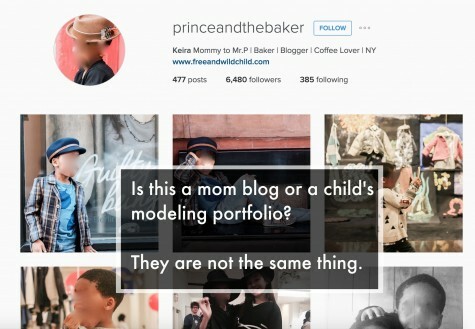 Let me challenge you with this: is mom blogging when you don’t really talk about motherhood but only about your children? When people ask me if they should start a mom blog I tell them they should do whatever makes them happy. When they ask me how to make money from it I shrug. I really don’t know. I know one thing. I know that kids in France may soon be able to sue for the funds that their mother’s Instagram accounts generate and I wouldn’t be surprised if some bloggers’ kids here in the US called a lawyer and asked for some of the family money to be directed solely at them. My friend Heather Spohr has most of her blog revenue go into accounts for her children. Here’s a question though. 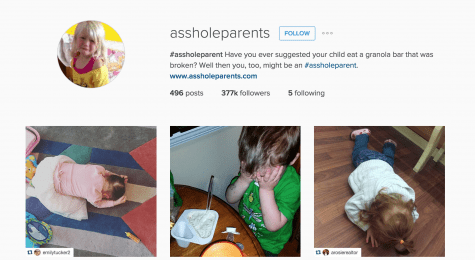 What happens if you’re the child of an #AssholeParent. Do you have to wait until you’re 18 to sue them? Should you be a mom blogger? Well, you can pick up a dog for $45 at the pound and they’ll never know if you’ve used social media to humiliate them. So, yeah, maybe that’s a better plan.